MANILA – Amid racist assassination threats from white neo-nazi supremacists, the issue of race doesn’t seem to affect the inevitable outcome of the race to the White House with the historic victorious run of Democratic Sen. Barack Obama of Illinois outpacing Republican Sen. John McCain of Arizona. And speaking of his losing rival’s home state, Obama is now closing in on McCain’s very own precious turf, as the latest Arizona State University/PBS affiliate Channel 8 survey conducted on October 23-26 shows the Democrat catching up on the Republican in Arizona by –2 percent, at 44-46 percent, with an error margin of 3 points. The latest Time/CNN survey conducted from October 23-28 shows Obama slowly narrowing the gap between him and McCain in Arizona by –7 percent, at 46-53 percent with an error margin of 4 points. And the same Time/CNN survey shows Obama also slimming McCain’s lead in two other ex-strongly Republican states: in Georgia by –5 percent, at 47-52 percent, and in Missouri by –2 percent, at 48-50 percent, both with an error margin of 3.5 points. 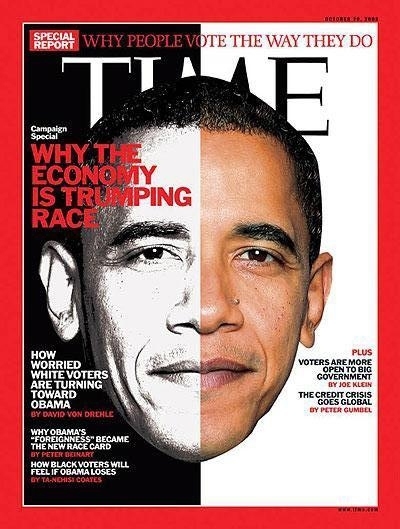 Yet the Time/CNN poll and two other surveys conducted from October 22-26 all show Obama outrunning McCain in Pennsylvania by 12 percent, at 55-43 percent in Time/CNN, with an error margin of 4 points. The 12-percent Obama lead in Pennsylvania is also reflected in the latest Quinnipiac University battleground poll, at 53-41 percent with an error margin of 2.7 points, and in the latest Associated Press/GfK battleground survey with an error margin of 4 points. The Time/CNN poll shows Obama leaving McCain behind in Virginia by 9 percent, at 53-44 percent, and in Colorado by 8 percent, at 53-45 percent, both with an error margin of 3.5 points. The same survey shows Obama outwitting McCain in Nevada by 7 percent, at 52-45 percent, and in North Carolina by 6 percent, at 52-46 percent, both with an error margin of 4 points. It shows Obama leading McCain in Ohio and Florida by 4 percent, both at 51-47 percent, with an error margin ranging from 3.5 to 4 points. However, the Quinnipiac Univ. poll shows Obama defeating McCain in Ohio by 9 percent, at 51-42 percent, and in Florida by 2 percent, at 47-45 percent, with an error margin of 2.7 points. But while the latest Marist poll conducted from October 24-27 shows Obama ahead of McCain in Ohio by 3 percent, at 48-45 percent, it shows the Democrat trouncing his rival in Pennsylvania by 14 percent, at 55-41 percent, both with an error margin of 4 points. Aside from his lead both in Pennsylvania and Nevada by 12 percent in the AP/GfK survey conducted on October 22-26, Obama also stands on firmer grounds in New Hampshire by 18 percent, in Colorado by 9 percent, and in Virginia and Ohio by 7 percent, with an error margin of 4 points and a tie in both Florida and North Carolina. ← 6 days to go … Obama wins!